I had silky smooth hair once. Okay, another miracle product to share. I'm sure everyone's heard of the TIGI range. 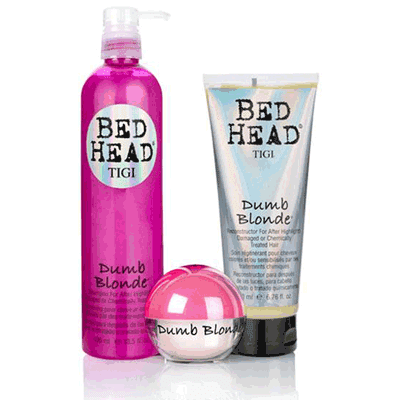 I'm (quite) sure no one has tried their Bed Head: Dumb Blonde range. The name just puts you off, really. But my aunt owns a salon, and she tells me that whether or not you have damaged/coloured/treated hair, it's best to get shampoos that cater to this kind of hair, because it provides really good care for your hair. So off I went in search of the perfect shampoo. People who know me should know the number of brands of shampoo I've tried - Giovanni, L'anza, Carlton, Redken, L'Oreal Professionel, Pantene (which is really bad for your hair, by the way), and goodness knows what else. I tried TIGI a few years ago, which is when I always got comments about my hair. People would ask me what kind of shampoo I was using, and what kind of hair regimen I keep. Ah, the glory days. Then I started my health trip and started searching for shampoos with the lowest cancer causing rate possible (try Giovanni, if you're into this sort of thing). And then I went off on my cheap shampoo trip - living in Melbourne with a staggering currency exchange rate of RM3.1 to 1AUD will do that to you. But then again, TIGI is pretty awesome, and only gets a rate of 2.5 or so out of 10 on the cancer causing products website. I wish I could back up these ratings, but I can't for the life of me find the website that I used to go to for this information. So I may just switch back. That having been said - make sure to use a clarifying shampoo every once in a while to get rid of gunk that inevitably forms from frequent use of the same shampoo/hair products. 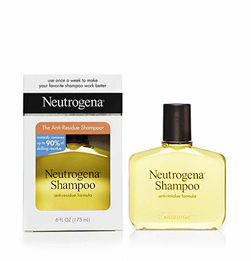 A good drugstore product is Neutrogena's Anti-Residue Shampoo. A more high-end version is Frederik Fekkai's Apple Cider Clarifying Shampoo. Remember not to use a clarifying shampoo too often - people who hardly put anything in their hair can use it just once a month, while people who style and load up on hair products more often can use it as often as once a week.